Former Dallas City Councilwoman Lois Finkelman had to talk a lot Thursday, Sept. 15. 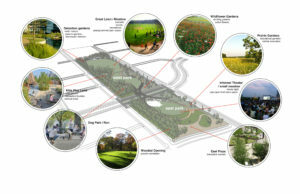 That morning, Finkelman first presented the park vision plan on behalf of the Dallas Midtown Park Foundation to the city’s Parks and Recreation board. That evening, she presented the vision again at a town hall meeting discussing the centerpiece of the massive Midtown Dallas District redevelopment. The Dallas Midtown Park Foundation is the not-for-profit organization founded two years ago by Finkelman, developer Scott Beck of Beck Ventures and North Dallas Chamber of Commerce President Bruce Bradford. 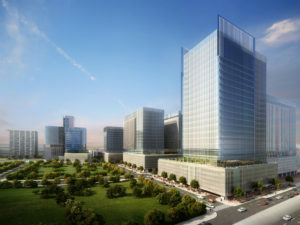 Together, according to Beck, they have worked with various stakeholders to shape a vision for a new park at the centerpiece of the massive 430-acre Dallas Midtown development, which includes redeveloping the former Valley View Mall. That project was first made public in 2013, but started years before under the leadership of former councilwoman and now State Rep. Linda Koop, R-Dallas. But Beck saw it as an opportunity to not just redevelop Valley View Mall but to take a “holistic” approach to suburban flight from Dallas into the fast-growing cities of Frisco and Plano. 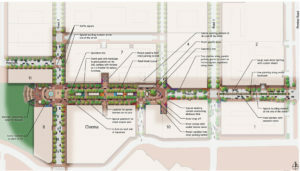 “But the city wanted the project to be bold. We needed to have a centerpiece,” Beck said. Midtown Park was just that. At the behest of Koop, Beck formed the Midtown Park Foundation two years ago. It received its formal nonprofit status last year. With a comprehensive plan in hand, they then asked the city to fund a study and the parks department to form a process to select a planning firm and vision study. After raising the private funds for the study they ultimately chose California-based urban development firm MIG, which is now collaborating with the working group and foundation board on the park plan. Beck compared the foundation to the Woodall Rogers Park Foundation, which oversees Klyde Warren Park. But that project took more than 20 years to complete. The Midway Park Foundation has taken a quarter of that time to create the park. “It’s almost parallel in scope (to the Woodall Rogers Park Foundation) but we’ve accelerated the process,” Beck said. Beck compared the Midtown District to another successful Dallas development. In just a few years, Beck noted, they’ve quickly jumped some major hurdles. The park will impact all of Dallas, Beck and Finkelman said, thanks in part to a tax-increment financing district, a commonly used method for public financing community-improvement developments. The TIF also funds a “desperately needed” redevelopment of Southwest Center Mall in south Dallas. In Beck’s estimate Midtown will bring billions of dollars of revenue to the region in the next 30 years. Of that, a significant portion will go toward redeveloping Southwest Center. “The park will be the centerpiece we see attracting new development to the city, instead of going north,” Beck said.